In rough shape, but the Templar is scarce & worth restoration. Nice watch but I don't think it's a Mercury. Check the lugs. Side-by-side comparison with Lisa's Mercury look like the same lug design, miter corners, same angles, etc. I can't load pictures to any comments block or I would show the compare pics. What would you suggest it is other than a Mercury? Yes, they are both the same, neither matches the ad. I have no idea what it is. So what we have here is two watches that don't agree with the ad. I don't see another Bulova tonneau with the shape of the Mercury in any of the ads. I have added a picture with the ad watch in the vertcal position that may enhance recognition. Ya recon the ad could be inaccurate? 'TEMPLAR' without doubt a 100% match. I changed it 3 times, it didn't take! The case serial no. 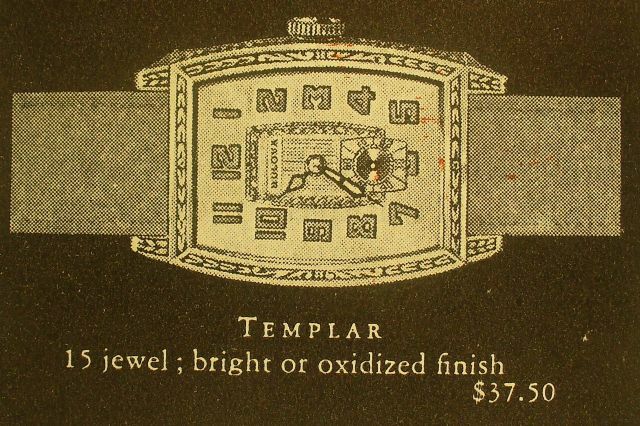 would date this watch to 1929, and as such would be the "Templan" as in the 1929 ads and the watch name DB.